Sri R.Kondala Rao, Technical consultant to the Government of Andhra Pradesh, for the water supply projects undertaken by Bhagawan." Sri K.R.Paramahamsa, IAS (Retd. 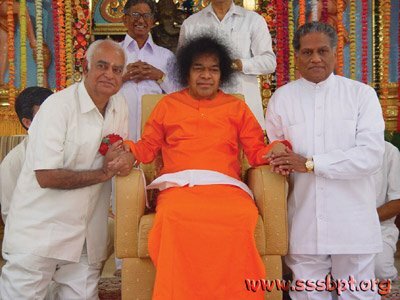 ), who has held various positions in Bhagawan's institutions and who is presently in charge of the 'Deena Janoddharana Pathakamu', the home for destitute children established by Bhagawan. "..Sai Baba has said nothing publicly about the allegations laid against him. When the Telegraph Magazine contacted K Chakravarthi, secretary of the Puttaparthi ashram, he said, 'We have no time for these matters. I have nothing to say' and terminated the call." Such a conscientious man. And according to private sources, Chakravarthi also treated the BBC film crew in a similar manner. At the outset Chakravarthi was cordial towards the producer and even took him on a guided tour of the Super Speciality Hospital and other buildings. The minute the allegations were raised all bets were off and the BBC were practically thrown out of the ashram. 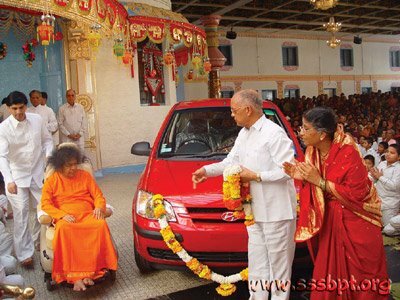 For this wonderful and upstanding behaviour, he is rewarded with a car. G. Venkataraman is no better either. This is a person who, in the interests of damage control, downplayed and blatantly denied reports leaking from Sai Baba's ashram by devotees relating to Sai Baba's ill health, which caused him to change the schedule of his public appearances and also having his movements restricted to being driven around in a golf cart. This is a person who penned an editorial that complained when letters are written to the (London) Times complaining about two articles they published. On top of that, in the same editorial he mocked Al and Alaya Rahm (who was brutally abused and raped by Sai Baba) for having their backs to the camera in the SEDUCED documentary! As if that wasn't enough, he then proceeded to give his own biased take on the UNESCO affair. Naturally, he is rewarded with a new car. After all, Sai Baba is simply felicitating them for their "invaluable contribution and dedicated service in Bhagawan's institutions and service projects". Such are the rascals and scoundrels who indulge in dastardly endeavours underneath the sneering veneer of puffed-up self-righteousness and piety.